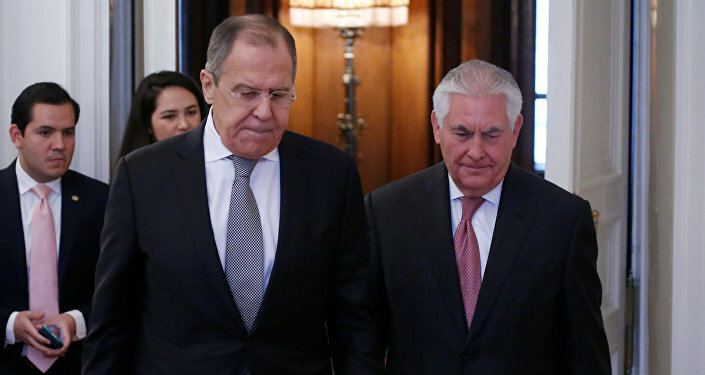 The results of the talks with United States Secretary of State Rex Tillerson will not be visible any time soon, but Russia and the US has agreed on dialogue, Foreign Minister Sergei Lavrov said. On Wednesday, Tillerson ended his first visit to Russia in his new post. He met with his Russian counterpart Sergei Lavrov and Russian President Vladimir Putin. The talks were focused on the current state of relations between Washington and Moscow and such issues as the crisis in Syria, the recent chemical weapons incident in Idlib, disarmament and the fight against terrorism. According to diplomatic sources, the sides spent 99 percent of the time discussing the Syrian crisis. Lavrov said the sides discussed the need to thoroughly investigate the reported use of chemical weapons in Idlib, adding that Moscow has seen Washington’s readiness to support an international investigation into the events. "Tillerson had an important conversation with President Putin for two hours. We also had talks before the meeting in the Kremlin. Moreover, we had informal talks for half an hour. Maybe, the results will be visible in the near future. At least, we agreed to establish dialogue on a number of important issues," Lavrov told journalists. Grigory Yarygin, a lecturer in the Department for American Studies at the St. Petersburg State University, in an interview with Radio Sputnik suggested that despite being supportive of an investigation into the Idlib incident, Washington will not be actively involved in it. "Washington officially supports the idea of a probe, but they will not be actively engaged. The reason is that the US establishment has already made their decisions, including in foreign policy. They will promote those decisions. So, Washington is unlikely to take any constructive steps, including in this investigation," Yarygin said. At the same time, according to the expert, certain conclusions can be made from Tillerson’s visit to Moscow. "There will be a counter-decision on Syria, which means focusing on the problem in the region — that needs to be resolved, instead of focusing on personalities," Yarygin said. He said that in this context Washington sent a certain message to Moscow. "I think that their statements during the press conference and the length of the talks suggest that Tillerson may have sent a message from [US President Donald] Trump on the possible way to resolve the Syrian problem. Without such a message, his visit would be symbolic. These talks designated the shape of the current problems in the Middle East and approaches to resolve them," Yarygin concluded.